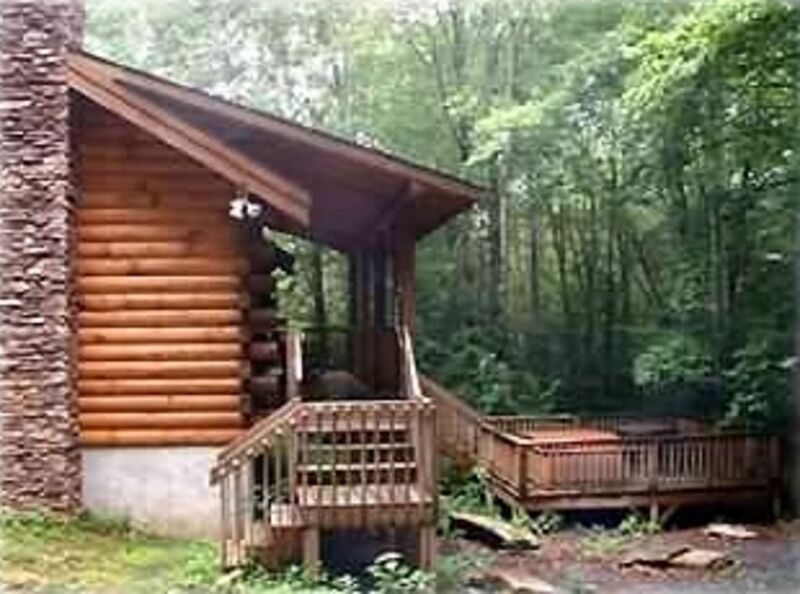 Luxury Honeymoon Log Cabin for Two-Private-Creekside Setting! Looking for a gorgeous, relaxing cabin? THIS IS IT! Yearling is the perfect choice for your anniversary, birthday or honeymoon celebration. Such a wonderful retreat - some guests have said it is like having your own private spa! Yearling comes fully furnished - king-size bed, designer linens, outdoor hot tub by the noisy creek, front porch rockers to view/listen to the creek while sipping morning coffee, a picnic table on the hot tub deck under the trees; woodburning fireplace for that romantic evening fire, Hi-Def DirectTV satellite receiver, 32' Sony Hi Def LCD TV, and DVD. The Yearling offers an everything-you-need kitchen and a luxurious bathroom fully-appointed with all you could want - jacuzzi bath tub for two, double sink vanity and separate shower. After a day of hiking/exploration, you may want the relaxation that only an outdoor hot tub can offer. Step down to the private deck by the incredible creek, where the hot tub and picnic table await. Or rock your cares away in the wood rockers on the covered porch. From either location you can see the creek that crosses this property. For the more adventurous guest - put on your boots and go wading! Some great ‘nooks and crannies’ among the boulders and rhododendron are right there on the Yearling property. The Yearling is nestled on Laurel Creek road in a very natural, peaceful and private setting. PERFECT for Honeymooners, Anniversaries, and Birthdays - Any SPECIAL Occasion! Very wooded and private setting with rushing Laurel Creek running thru property. We had such a relaxing stay at The Yearling! It was just what we needed for a romantic and refreshing weekend. We wish we could have stayed longer than 2 nights. The creek and hot tub were so nice and peaceful. The only recommendation we would have would be curtains or blinds on the street-facing window and door. We would probably bring some next time. Everything else was absolutely perfect! We look forward to staying again as soon as we can. Alyson, thanks for your comments and rating. We look forward to your return to The Yearling. Clean, cozy, and every detail was taken care of. Our stay was AMAZING. The cabin was perfect size for the two of us. We enjoyed the hot tub and large indoor tub, deff helped us relax after hiking all day. The kitchen had everything we needed and the grill was a nice touch. The fireplace made the cabin super cozy and we loved waking up each morning the the sound of the creek in the backyard. This vacation will be one for the books and we will absolute be coming back to stay in the Yearling. Kristin, thanks for your comments and rating. Glad you enjoyed your stay at The Yearling and we look forward to your return. We loved our stay at The Yearling Cabin! The creek and waterfall were a relaxing accompaniment to the hot tub. We are regular visitors to the area and we were very happy with the location of this cabin. We love to visit Banner Elk, The Mast General Store and Banner Elk Winery found all of our favorite stops were easy to get to from this home base. We will definitely stay here again. My husband and I came here for a weekend getaway. With 3 small kids, that's not something that happens often! Despite the weather not being ideal, we loved our time here. We had everything we needed and loved having the stream in our backyard. Comfy, cozy, with plenty of privacy. We would definitely stay again! George, thanks for the 5 Stars!!!!! Loved this property! Loved how remote it was! We’ll be back! Virginia, thanks for your comments.